Water. Something I’ve loved or feared, or more recently, pleaded for, throughout my life. As a child, they couldn’t get me out of the tub, let alone the wading pool—and later—the ocean. I was fearless. I was a fish, a mermaid, a dolphin, and the waves were the best part as I learned to dive under the base of the break, pushing off the sandy bottom to pop into the air on the topside of the swell. I was light, lithe, and at one with the water. I’d emerge with shriveled fingers and toes, feeling gravity take over once again, trudging heavy and awkward onto the shore. For a while, I lived in a home we came to call “The Water House”. Every time we turned around, the house was flooded. There was a backyard pool that oddly sat higher than the house, so every time it overflowed (torrential downpours, earthquakes), water spilled into the house. The washing machine and dishwasher both gave us trouble; the plumbing backed up on a regular basis; and we had a dog and a cat that refused to do their business outside or in a litter box. My relationship with water was not good during that time. When feeling overwhelmed or under stress, I find myself dreaming about swimming in a stormy ocean filled with massive waves. I take a deep breath and dive under, kicking like mad to come to the surface. Once I reach the surface, I struggle to tread water in the turbulent sea. Off in the distance I see a small ship bobbing on the waves. A few months ago, water became a central theme once again when we began to drill a well for water. I won’t go into the whole story, but what we naively thought would be a simple, though expensive process, turned into an ordeal fraught with stress and anxiety. After two attempts, to our great despair, we still had no water. I dreamed of water: gigantic waves cascading over me; wading knee-deep, sometimes waist-deep through water-filled rooms; I’d hold a glass under a tap that sputtered dust. We both dreamt, but we didn’t rest. I drank wine, wishing I could turn it to water. 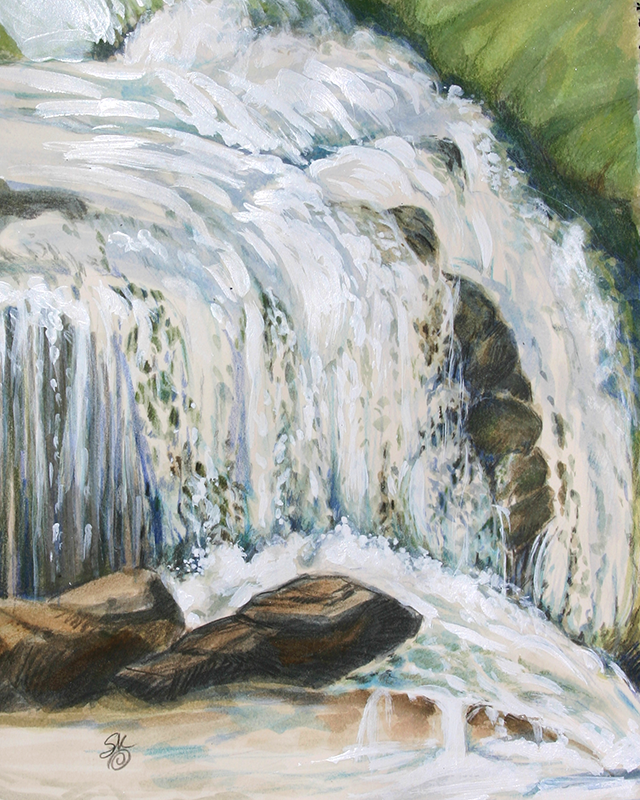 In November, as we attempted for the third and last time to find water, I felt compelled to paint Water, pouring my fear and longing and prayer into this piece, focusing all my energy into Water. That same day, I burned sage while pleading to Mother Earth to bless us with water. In the end, Clint chose the right spot and Mother heard me. We have water and we are grateful. It was one of those days in early spring where the light is milky and the colors are softened by the moisture in the air. Mother Nature hadn't quite decided whether she was ready to let go of winter yet. Earlier that morning, it snowed on us as we tromped over muddy spots ringed with crunchy ice; the first blades of grass bravely pushing through a gooshy layer of last year's leaves. We found an old rusty lantern hanging off a fence post just before we turned around into the chilling wind and walked back to the car. We were looking for a road we'd remembered we'd been on, but couldn't find. Clint thought it was one direction—I, another. We pulled over, and while he studied the map, I studied how collectively, all those little blades of grass actually looked very green from a distance. Instead of a few struggling blades here and there, they joined together to declare the promise of spring. The up-close view was still ruled by the earthy grays, browns, and rusts of winter. The long view, showed me spring. 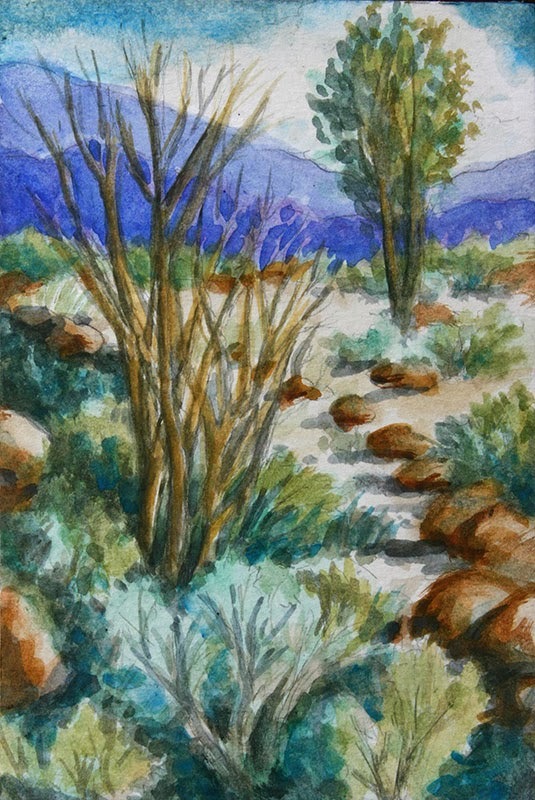 With this watercolor painting, I wanted to capture that soft winter light and color. Generally I work more boldly, having long ago declared I would never paint in soft ethereal pastels—as was quite popular for a while. Some secret club mandated watercolors were to be whispery visions of roses and kittens. Thankfully that passed—along with only being able to buy rugs in mauve and baby blue. We were heading west that cool morning in early spring, a little sad because we were leaving Colorado. At the gateway of the wide-open spaces of the Res, ahead of us were miles and miles of land dotted with the occasional trailer and dusty clouds of sheep. The town of Shiprock was behind us and the monolith from which the town took its name--the monolith ruling that part of the world--sparkled in the day's rising moisture. A muddy excuse for a road would have taken us to the base of Shiprock, but we elected to continue on toward Teec Nos Pos and Canyon de Chelly. A few minutes later, I turned back and took in the long shadows of the ridge, Shiprock beginning to fade to a ghost in the distance. Silently I said, farewell, knowing it might be a while before I returned. The shadows on the ridge were deep indigo and the alluvial slope at the base of spires was a lace skirt of greens woven from early spring grasses. This is a mixed-media piece. I threw pretty much everything I had in the studio at this one. It started out as a monoprint. I did a drawing on tissue, turned it over, and recreated the image on the Plexiglas plate backwards, so the mirror image of the print on paper was oriented the right way in the final piece. It would have been sacrilegious to paint an icon like this backwards. One of the things I love most about creating monoprints is the texture added by the transfer of the paint from the Plexiglas plate to the paper. You can still see that texture in the sky and foreground, tiny blobs of paint here and there. 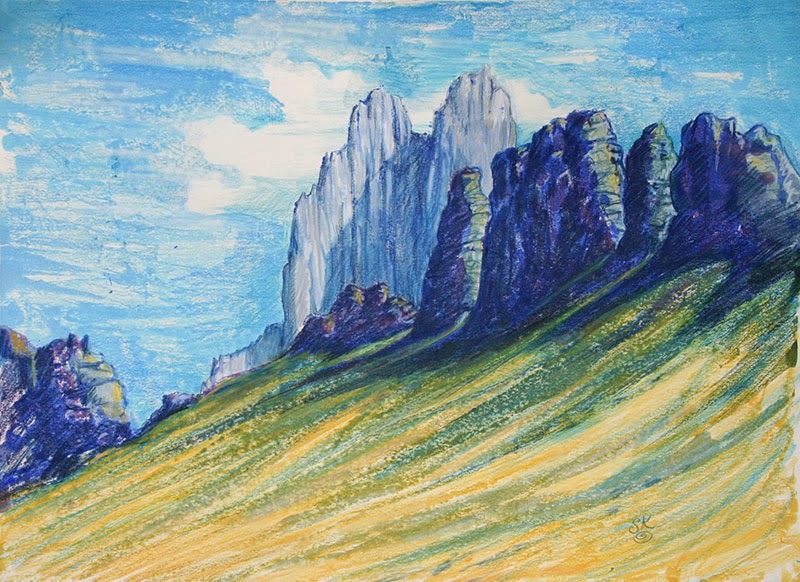 After several transfers: a blue, a magenta, a yellow, then one more round of each with variations, I cast aside the plate and used colored pencil to add detail directly to the paper, the last glimmering strokes applied with a silver pencil. The result—as brilliant and beautiful as I remembered. Note the new signature. The why for this choice will be a topic for the future. Now that fall is upon us and I sit here in a sweatshirt, I think about when I started this painting. It was a sweltering summer day outside of Lone Pine, which seems so distant now, though it was not that long ago. I remember wishing for cooler weather that afternoon, as the smoke-scented wind buffeted my right ear. I captured my beer between my knees so it wouldn’t blow off the table. 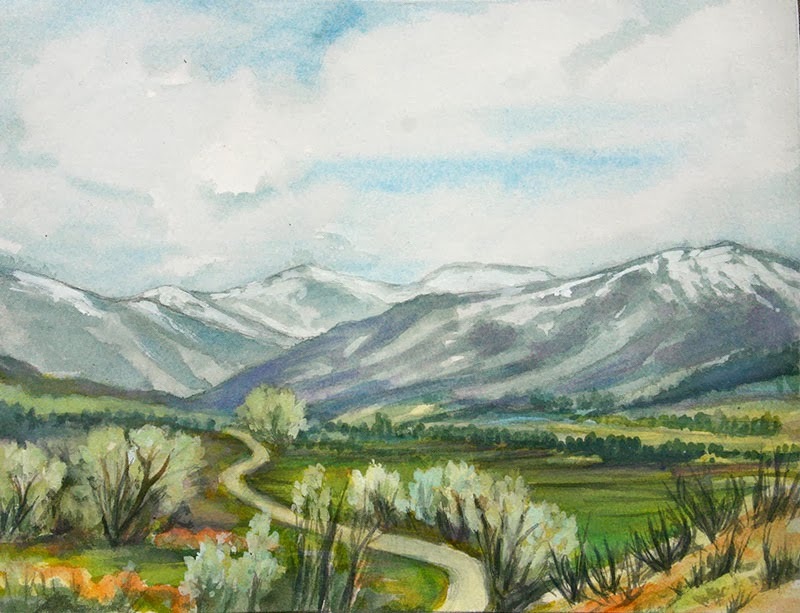 It was too windy to paint, so I did a detailed drawing of the brush and struggling cottonwoods backed by the bluing Inyo Mountains. I sat in the begrudging shade of one of the few remaining trees that somehow survived despite too many dry winters and sporadic watering by the caretakers. I brought the drawing home, and a few weeks later, pulled it back out and painted the scene. I wish I were there now, actually. Today, the sun would feel good on my back; the creek would be a welcomed and friendly babble. It’s much more fun to paint on location than in my studio –- though in my studio I don’t have to contend with wind or bugs. Luckily, the memory of the day came back to me as clear as when I was there; the colors and sparkle still fresh in my mind. There is still something yet to finish on this piece. I haven’t signed it yet. I’m still undecided about how I will leave my mark. Well, my adolescent desire to be different has caught up to me and it has created a pall of dis-ease. 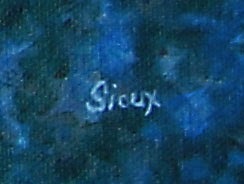 In what I always thought of as a creative attempt to shrug off being just another Sue in a sea of Sues, Susies, and Susans, years and years ago I started spelling my name as “Sioux”. I’ve signed my paintings that way for years. People would ask if I were Native American, and I would tell them the closest I have come to being Native American was when I was accused of running around “like a wild Indian” as a child. But, over time, as I experience more of the world outside of Looney-fornia, particularly the time we’ve spent of late in the Southwest, I’ve become more aware of and sensitive to Native American concerns. I do not want to offend the people who will someday be my neighbors by appearing I am something that I am not. I was, and still am, a simple Irish girl with a burning desire to stand out from the crowd in some way. In hindsight, maybe Grand Prix would have been a better choice—showier and less offensive. Though over the years I’ve grown more comfortable with the me that is me; Susan isn’t so bad after all, I guess. 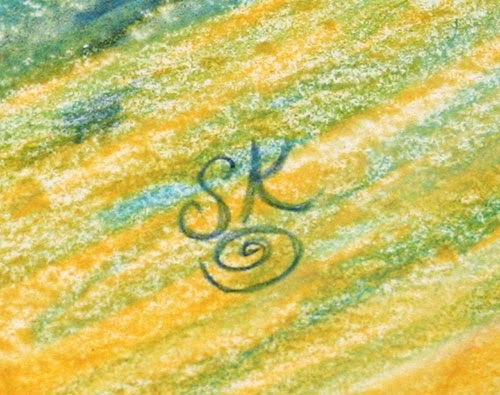 So, henceforth, you’ll see a different scribble on my paintings. Long after I’m gone and my artwork is a ubiquitous fixture in thrift stores, another generation of collectors can wonder if Sioux and whatever-I-settle-on are one and the same.